Fifteen years ago, Howard decided it was time to stop working as a lawyer, and become what he’d always dreamt of – a farmer. So he planted some olive trees. Now governed by the laws of nature, he had to be patient. After seven years, the first harvest grew. 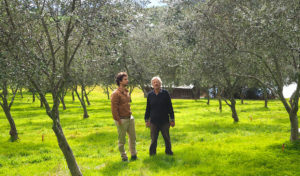 Howard proudly pressed his first olives into extra virgin olive oil. Howard’s son, Jeremy, realising there was no Australian olive oil in the US, decided to introduce New York to the family oil. Jeremy remembers the day he arrived. “The largest snowstorm in fifteen years fell on the city. But having come so far, I just borrowed a coat and from store to store, pulled a suitcase of oil through the snow.” After waiting – often hours – until buyers would see him, Jeremy would dust off the snow, hold a bottle to the fading afternoon light, and pour… To his excitement, almost every buyer said, “It’s delicious, and a beautiful bottle! Send me a case tomorrow”. Three years earlier, Jeremy lived in Latin America, where he met many women who had experienced abuse, (often by the men who supposedly loved them). As his understanding grew of the magnitude of the issue of violence against women, Jeremy felt deeply compelled to help where he could. That night of the snowstorm, before falling asleep, Jeremy vowed that as Yellingbo grew, he would use the business to make a difference. Yellingbo now donates $1 from every direct online sale to women and girls’ development projects.